Want to Save Money? Visit a “Dentist Near Me”! Many people operate under the misunderstanding that visiting a dentist twice a year is a waste of money. They may reason that they brush and floss their teeth, so there is no need for them to go in for a semiannual cleaning and checkup. Besides that, they may not want to pay for dental insurance, or perhaps they have insurance but don’t want to pay for the portion of their treatment that their policy doesn’t cover. But are these people really saving money? As your “dentist near me” explains, the answer is no. No matter how diligent you are about oral hygiene, it’s likely that you’re not getting your mouth totally clean. There may be a spot or two on your teeth that you accidentally miss when you’re brushing, or maybe your teeth are a bit crooked, and there are a few tight spaces that you can’t quite reach with your floss. Plaque loves to build up in these places, where it can quickly lead to cavities. Regular dental cleanings clear away the plaque and tartar from places that you miss during your regular oral hygiene routine. Moreover, your dental hygienist or dentist can let you know about those trouble spots so you can be more diligent about cleaning them in the future. 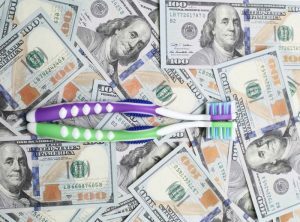 Preventing cavities through routine dental appointments can save you loads of money! If you don’t have insurance, a professional cleaning may seem expensive, but it’s not nearly as expensive as a root canal and crown, a treatment that can cost thousands of dollars. Did you know that many dental insurance companies cover between 80 and 100 percent of the cost of preventive care? Therefore, you may be able to get two professional cleanings each year, along with an annual set of X-rays, for nothing more than the price of your monthly dental premium. Insurance policies encourage preventive care because they don’t want to end up paying for much more expensive procedures. In fact, their willingness to pay gets reduced with the complexity of dental work. Many companies cover just 50 to 70 percent of the cost of things like fillings, crowns, and root canals. Still Don’t Think You Can Afford Dental Care? Not visiting the dentist regularly is a huge gamble that can hurt your wallet — and it can hurt you in a much more personal way as well. Many dental problems, such as severe decay, are quite painful. They can disrupt your life and hinder your ability to enjoy your favorite foods. Other issues, such as oral cancer, could even take your life if they aren’t caught early on. You can’t put a price tag on oral healthcare, which is why we encourage all of our patients to take full advantage of dental insurance. We also offer financing for folks who need the cost of their treatment to be broken down into monthly payments. Our goal is always to help you maintain a healthy mouth without taking a wrecking ball to your budget. If you have concerns about paying for your dental work, please contact us at 218-281-1301, and we’ll see what we can do for you. Comments Off on Want to Save Money? Visit a “Dentist Near Me”!